Please join us at one (or more!) of these volunteer shifts. We strongly encourage our volunteers to return for the same shift for at least half the term (5 weeks) and ideally for the full term (10 weeks). Our riders and our horses get to know our volunteers, and the benefit of therapeutic riding is enhanced when the same volunteers are working week over week. That's why we love to have repeat volunteers! 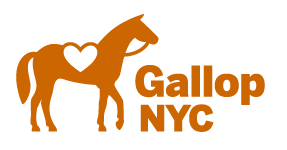 The daffodils and hyacinths are in bloom: And GallopNYC is back! YAY!